The Rosemary Plaskett Hayman Memorial Scholarship program was established in 2004 to help send the children of our employees to college. Any child or grandchild of our employees that wants to go to college or trade school is eligible for this scholarship. The scholarship will pay up to $500.00 per semester that the child attends a credited university, college or trade school. We are very pleased to have awarded 9 students with this scholarship program since 2004. We look forward to having many more in the future. 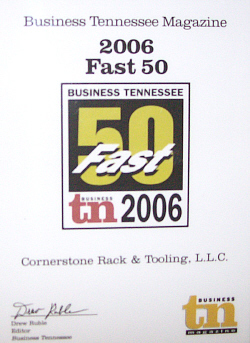 * In 2006, CornerStone was recognized as one of the top 50 fastest growing companies in the state of Tennessee by Business Magazine Tennessee. John Lyles thought he was retired from the finishing industry. He was ready to play golf and enjoy himself. But one thing kept bothering him…Paul Robinson. Mr. Robinson had been in the plastics plating business for more than 20 years himself, but he was still itching to work. He saw a need in the industry for high quality, precision racks for chromium plating and painting plastic parts. That is why he contacted Mr. Lyles. He needed a partner, and he knew that Mr. Lyles knew the business. One of Mr. Lyles’ friends, Gerald Hayman, founder of Power Technology (Leesburg, FL), also joined them, and Cornerstone Rack and Tool was established. There are many factors to consider when building electroplating racks. These factors can only be clearly understood through experience. Critical factors include electrical current distribution, drainage and warping. With plastic parts, every part of the rack has to be adjusted perfectly. Precision is key. Years of experience helped the company achieve this accuracy. Attention to detail helps to make sure each rack is exact. This does not simply mean developing better ideas on how to create a clip that holds a part just so, but ideas for all parts of the rack design. How will solution drain from a part? If it is not set up to drain properly, solution can pool in areas of the part and contaminate subsequent rinses and plating solutions. This can result in surface roughness on the parts. Also, the parts will not be geometrically correct to fit any mating parts. This is crucial, since many of the parts have to fit tolerances of 1-2 mils. Are the clips perfectly aligned on the finishing rack? If parts are misaligned just a fraction on a rack and/or specific clips, they will be scrap or damaged parts. Racks are made of copper and all the clips are either titanium or steel, depending on what the customer wants. Titanium is more durable, but stainless steel is easier to work with. During plating, contacts (clips) are plated as well. Contacts must be stripped again and again to provide adequate electrical current to the parts. Steel wears out much more quickly than titanium does, particularly if the stripping process is not well controlled. Stripping is another important consideration in rack manufacturing. Getting it right for every application is simply part of Cornerstone’s philosophy. Because parts are plastic, they do not conduct electricity. That is why parts are plated with electroless copper or electroless nickel to render them conductive. To plate these parts, however, you need a bridge that will conduct the electricity to the part so it will plate, this is the titanium or steel contact. This contact is first plated in the acid copper strike, building the bridge from the tip to the part. Rinsing is also critical. If the part does not rinse well and chromic acid remains under the rack tip, the contact will blow out and the part will not plate. Any plating that is on the part may flake off in the nickel and chromium baths, contaminating them. This could cause roughness on subsequently plated parts. Because of the rack’s ability to conduct electricity, amperage is the first variable factored when designing a rack. “What we do is calculate the square footage of the part. Then we calculate how many amps each part on the rack will carry,” stated Mr. Robinson. “You also have to consider how much time each rack of parts will spend in each tank. Racks/parts do not spend as much time in the chromium bath as they do in the nickel bath. The more time parts are in the tank, the more heat builds up. “Many people think that you do not have to concern yourself as much with the nickel bath. They believe the chromium bath is more of a concern because that has the most asf. Well, that isn’t the case. Your biggest concern is the nickel bath because of the amount of time the racks are submerged. This allows heat to build up,” he concluded. Once the size of the material is calculated, the designers backtrack to determine how to rack the part. One may think that a large contact is required because of the amount of amperage flowing through the rack; however, that is not always feasible, since the parts are plastic. Instead, more contacts may be needed, such as four on a part that would seem to require only two, since the electrical current travels over the surface of the plastic part rather than through it as with metal parts. This may cost more initially, but the plating will be better and the reject rate will be considerably lower, saving money in the long term. Once a rack is built, it is soldered…all of it, every contact and joint. If there is electrical contact on the rack, it is soldered. Why? Because this provides a solid circuit from the point of electrical entry through to where the rack contacts the part. The solder eliminates gaps and/or breaks in the electrical flow that could lead to heat buildup. “It is one of the biggest enemies you have when designing a plating rack,” noted Mr. Robinson. After soldering, racks are blast cleaned to remove excess solder and pit the metal. This provides the primer something to adhere to. The rack is heated prior to primer. How long the rack is heated and at what temperature is critical to achieving a good primer surface. If a rack is overheated, the primer will burn. If it is under heated, the primer will not adhere. Also, rack tips are treated with a release agent so that the subsequent plastisol is easily removed. After the rack is dipped in the plastisol coating, it is sent back into the oven to set the coating. The coating is not completely cured, but set to a point that employees can work with it more easily. The tips are then trimmed and the racks are sent back to the cure oven to bake out. Conveyor racks are usually only dipped once. Plating racks are dipped in the plastisol twice, and paint racks do not received a plastisol coating. Racks are then electrically inspected, adjusted, packaged and shipped. Cornerstone’s goal is for the customer to start running the racks immediately after delivery. The customer determines the hardness of the plastisol coating. Some customers prefer a harder coating than others, depending on applications. Racks used in abrasive blasting environments may need a harder plastisol finish. Cornerstone Rack and Tool started January 28, 2002. Established to fill an industry need for quality finishing racks for plastic parts, it has succeeded in a grand fashion. “Our first year business projection,” noted Mr. Lyles “was that we would hire four to five employees by year’s end. For our second year, we hoped to add at least 10 employees. After one year in business we have 22 employees. We try to provide the best quality at the best price for the best rack. After all, quality still sells.